NEWINGTON - John Kelleher has the dream job of many, peddling away treasures he’s spent a lifetime collecting. 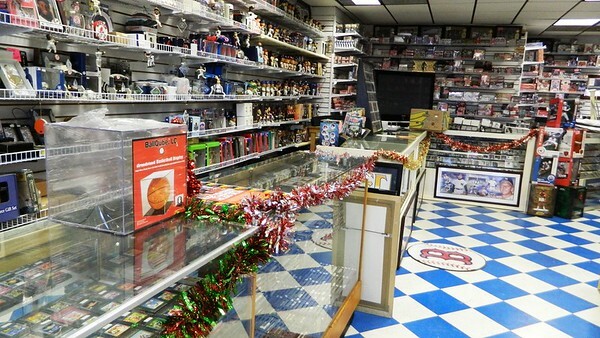 The East Hartford resident recently opened M&J Video Games & Sports Collectibles at 3277 Berlin Turnpike. It’s his family’s second store in Connecticut, with the first location on Queen Street in Southington. Kelleher had a store in Wallingford, but closed after a brief stint and moved to a plaza on Route 15 in Newington late in the fall. On a recent Saturday, staff unveiled their new sign at a ribbon-cutting ceremony. Sunday, Babe Ruth’s granddaughter, Linda Ruth Tosetti, joined the party. It’s Kelleher’s personal experience in the sports entertainment industry that brings big names into his two stores. He worked as Rocky the Rock Cat for 11 years for the former New Britain Rock Cats baseball team. 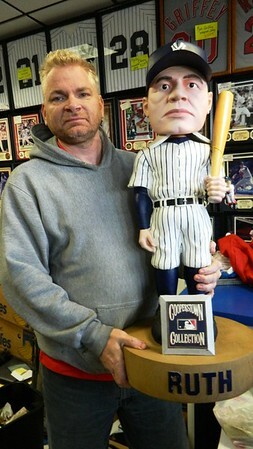 That’s also how he came across some of the rarer items on his shelves, like a 3-foot-tall Babe Ruth bobblehead doll. “Only 100 of these were made,” Kelleher said proudly, placing a Santa Claus hat on the figure’s head. Each piece comes along with a story. Maybe where it originated, how it was discovered or who he bought it from. The Newington store features hundreds of sports memorabilia, much of it signed by major league baseball players, pro wrestlers, hockey legends, football greats and basketball champs. Video game systems, games and other equipment take an equal share in the collection. But not the latest and greatest. Think more vintage. This kind of passion for treasure hunting is not learned in school. Kelleher grew up on the flea market and swap meet circuit, hanging on the coattails of a precious-metals dealer. Nowadays, gaming aficionados and sports fans come into the store and find a friend in Kelleher. They chat up the afternoon and on their way out, are astounded to discover the missing piece in their collection. For him, it’s these moments that make the daily organizing and hunting worth every hassle and haggle. The store’s regular hours are Monday through Saturday, from 11 a.m. to 7 p.m. and Sunday, from 11 a.m. to 6 p.m.
Posted in New Britain Herald, Berlin, Business on Monday, 1 January 2018 22:53. Updated: Monday, 1 January 2018 22:55.